In any business and even at your dental practice, your client’s reviews are very crucial for you practice to grow. It not only assess the bond you’ve created with potential patients, but also presents you how good you’re delivering your services to them. These reviews are for more effectiveness, rather than just word-of-mouth recommendations, because it cements your practice on a more formal platform. It also helps boost your reputation and brand because people are generally more satisfied when reviews are good. The fact is that a lot of people take reviews seriously and influence how much they can trust you with their dental problems, especially when it’s their first time with you. There may come a time that a client may not be satisfied enough and decides to give you a bad review. 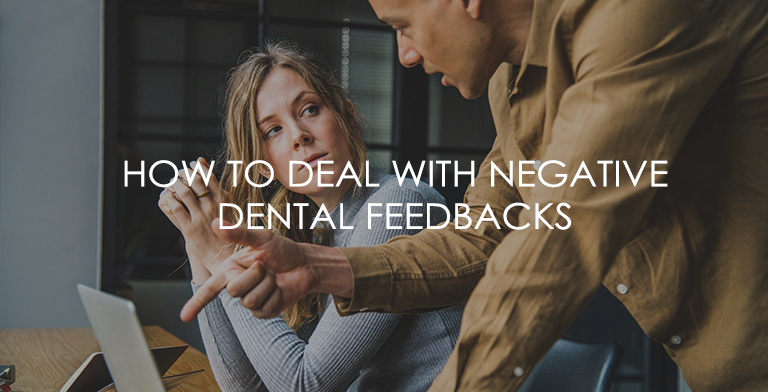 No matter the market, no one likes to receive negative feedback especially in medical services, like dental, because these can pose a risk in stopping future clients from approaching your practice. This is why it’s very important to know how to manage bad reviews when and if they do come. It may seem prudent at first to just ignore a bad review, but doing this may actually ruin your reputation instead. It may come off as if you don’t care or you’re not even remotely interested on the review. It’s acutely better to diffuse the situation as quickly as possible. The other advantage is that you may even be able to please the disappointed client. The mere action of responding to bad reviews means that you do care and reinforces the fact that you do have the client’s best interest at heart. We’ve all have to deal with a bad review or a negative feedback, and we know how bad that feels, but this isn’t the time to just lash out. You should know how to take a step back, breathe and set an unbiased mindset when tackling bad reviews. You shouldn’t act on feelings alone especially at moments like these wherein all fair judgment is out the door. You should face it as calm as possible because it shows how professional you are. Starting a fight with a disgruntled client gains nothing especially when arguments are available for everyone to see. Addressing the problem in a civil manner is just the start and the real hurdle here is actually fixing the problem that the bad review showed. This means acknowledging the issue at hand by all perspectives and coming up with a concrete plan on how to fix it. You may also have to make contact with the client and inviting him back to discuss the issue in detail. Even if the client doesn’t want to take up the offer, it shows that you’re willing to resolve any concerns and that you actually care for the client’s overall experience and well-being.